The evening was introduced by the Rev David Chesters. 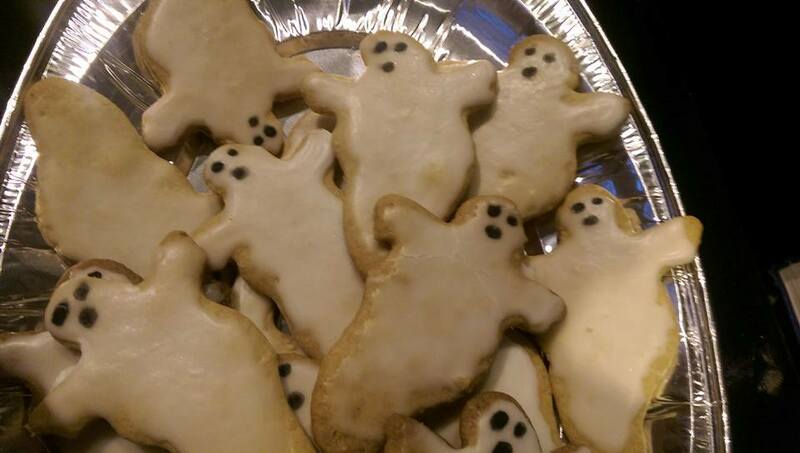 “Why come to a Church to launch a book about ghosts?” he said. “ A few years ago there was a ghost play in the ruins, and the audience came into the Church and they spoke about souls and spirits. God is a spirit, we worship him in spirit, it’s a very spiritual place” He said the Church was a “thin place” where the veil between heaven and earth was at its very thinnest. Mary Ann, one of 36 qualified Chester Tour guides took to the stage and spoke about the cover photograph taken by Mickle Trafford photographer David Mitchell. It shows the tour guides assembled in a ghostly pose amidst the ruins. 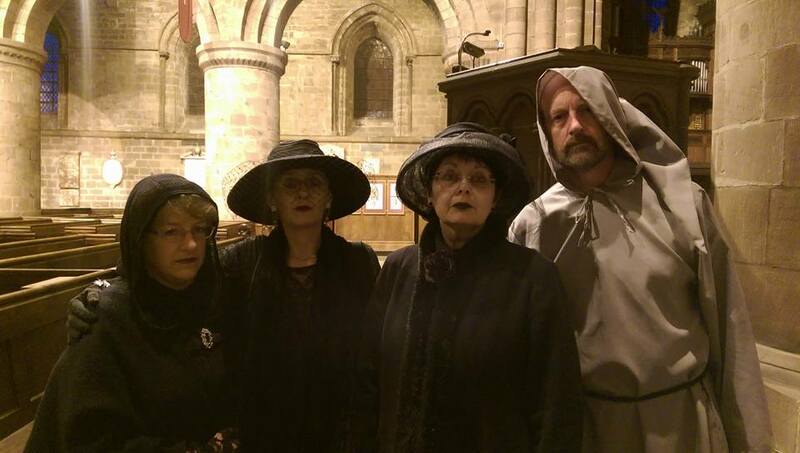 The mysterious back over allegedly shows a genuine spectre of a hooded monk…. In preparation for the book, she visited every building in the city reported to be haunted. Sally’s secret garden “seems to have 4 ghosts” she said, with some ghostly activity captured on CCTV. She says staff at the Queen Hotel have many disturbing stories to tell, particularly from the second floor of the building.. Ye Olde Kings head, a regular target for ghost hunters has cupboards and doorways opening and shutting on their own, and ghost children on the stairways. The 15th century Blue bell is said to be haunted by the ghost of a woman whose Royalist lover failed to return from the battle of Rowton Moor. She has been seen opening and closing the upstairs window… Staff downstairs have also heard the cries of a child, thought to be a servant girl who was raped and killed by Roundhead soldiers. Mary says that the last member of staff present every evening will say “goodnight” to the presence that is often sensed. Tour guide Liz Roberts, suitable dressed in black gave us a brief tour of the grounds of St John’s as night started to fall and bats were flying through the ruins. St Johns was Chester’s original cathedral, was the site of a civil war cannon that besieged the city, and the famous “coffin in the wall” and the many legends associated with it. Supposedly when the coffin was uncovered and opened the bones within fell out and many crumbled to dust. The monk that is said to wander the grounds, looking for his own remains, which were reburied in an unknown location. Back in the Church we spoke to Sally, of Sally’s Secret Garden on Bridge st row who described ghost activity in her shop ” We have orbs .. but most of the time he just makes a mess of the shop, turns all the incense boxes the wrong way round, he’s a young lad that makes a mess , pictures falling over for no reason at all .. I used to go upstairs and I couldn’t breathe in a certain room ” This sensation was noticed by customers as well, and research found that a Sea captain had died of a chest infection in the room. 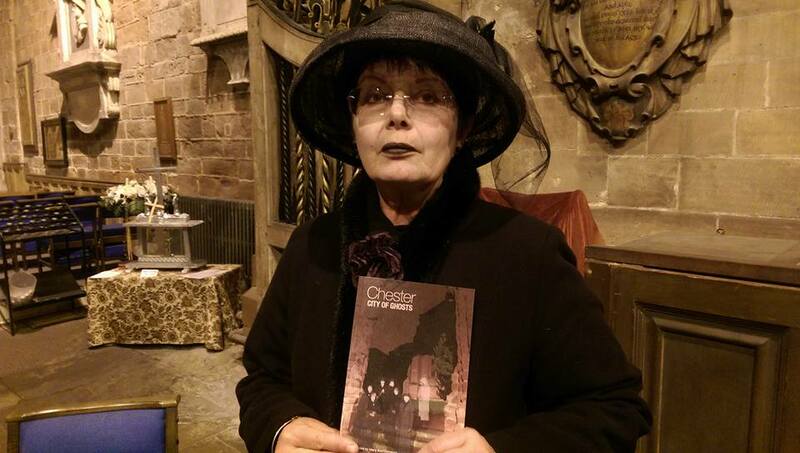 Liz Roberts : “we would like people to come on the tours and share their stories…they’re not just for tourists.” The ghost tours take place Thurs to Sat at 730 with tickets available from Ghostcity.com or the Tourist info centre. But is there something out there, lurking in the shadows? 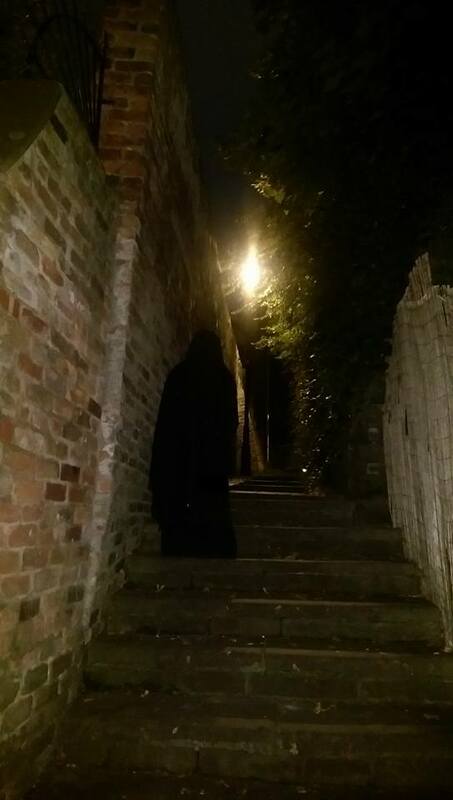 Having lived in Chester all my life, and often walked the lonely alleyways, I’ve never seen anything even vaguely supernatural, even at 4am in the morning. 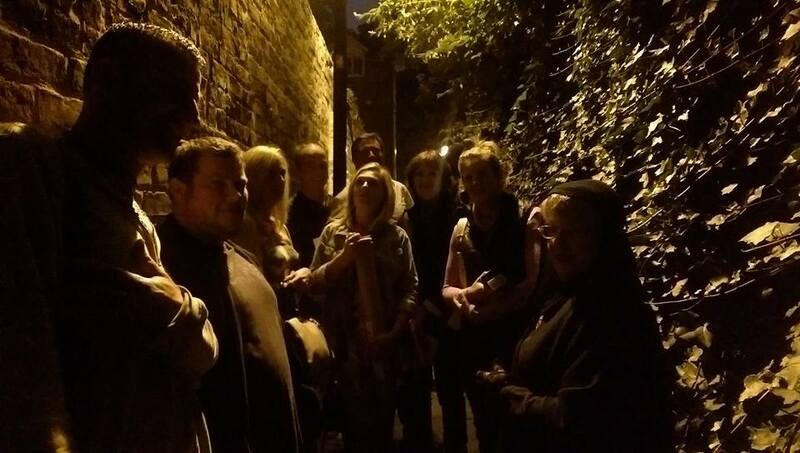 Liz took us down the haunted passageway from St Johns to the Groves, supposedly haunted by ( another) monk. “You can’t prove they do exist but you can’t prove they don’t. 9 times out of 10 you can explain it.. but you have to think about the “what if?”. Great blog and thanks for tagging Dave. Such an entertaining evening can’t wait to go on Liz’s ghost tour!